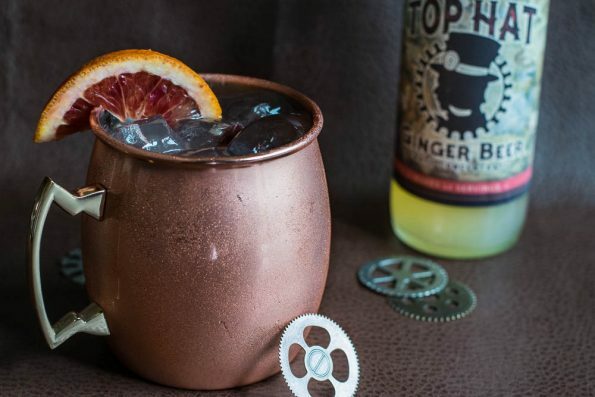 Grab your aviator goggles and fire up the dirigible, this steampunk themed 5 O’Clock Friday Cocktail is the Mules Verne! When we received our bottle of Top Hat Provisions Top Hat Ginger Beer Concentrate (one of the best ginger beers out there and only has one artificial ingredient! ), we wracked our brains trying to come up with a cocktail that wasn’t a mule. However, we kept coming back to mule type drinks and decided to just go with it. You might be asking why we went with a steampunk theme for a mule. Well truth is, we were completely inspired by the Top Hat Ginger Beer label which has a gentleman in a top hat in front of a large gear. Its completely aesthetic but we thought it was a great excuse to bring out the geek in us! 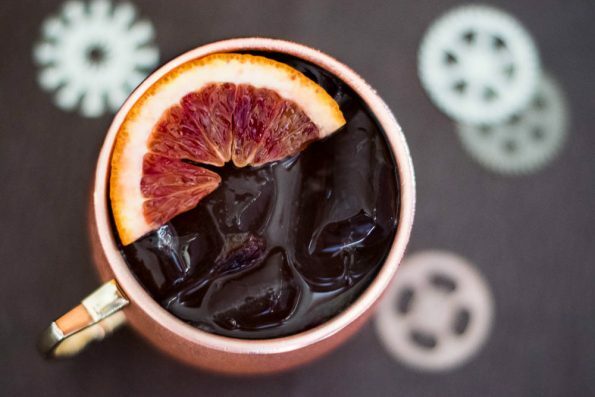 If you are feeling adventurous, you could cut your blood orange garnish in the shape of a gear (we tried but our orange was way too ripe) to make your cocktail a bit more themed. Top Hat Provisions is a San Francisco based craft beverage design, manufacturing & engineering company with a mission is to source, design, manufacture, deliver, engineer & activate the best craft beverage programs in the world. They install & support draft cocktail programs that are efficient, attractive & profitable for our clients & partners to operate. Contact them directly to learn more about their products and services. We’d love to see your rendition of this cocktail! Make a Mules Verne, take a photo, and tag it with the hashtag #GeekEats! Cheers! Thanks for sharing our post! Would you like to add the recipe for the cocktail to the post? If the format from the site doesn’t work I’d be happy to send it over! Thanks!